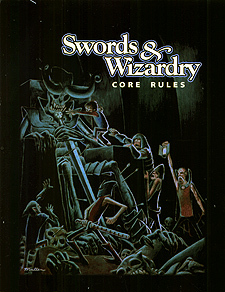 Swords & Wizardry is an OGL adaptation of the original 1974 fantasy role-playing game created by Gary Gygax and Dave Arneson, with select supplemental material (1974-1979). Prepare to be introduced to the old style of free form gaming. These rules are flexible and open to interpretation - designed not to cover all conceivable situations, but to allow good Referees and players the freedom to create and play games of their own design.